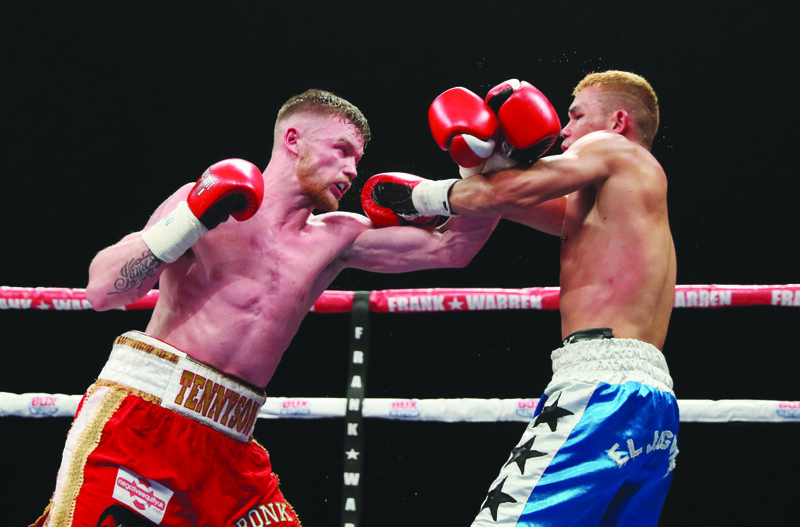 JAMES Tennyson has already been Irish super-featherweight champion, but to claim the national title he knows he faces a much sterner test than when he lifted it back in 2013. It was just his sixth fight when he blasted out Mickey Coveney in two rounds at St Kevin’s Hall, but a lot has happened since including a Celtic featherweight title win and British title loss. Given his quest for the Lonsdale Belt fell short against Ryan Walsh, some might see his return to super-featherweight and a fight to reclaim the Irish title as a bit of a step back, but that is not so. In fact, this is then most eagerly-anticipated Irish title fight since Tyson Fury and Martin Rogan squared off as the 17-2 Tennyson faces Dublin’s Declan Geraghty (14-1) who also has designs at breaking out into European level and beyond with a victory. This fight was actually due to take place at the end of last year in Glasgow of all places, but a cut sustained by Tennyson against Rafael Castillo on the same card Geraghty blasted out Khvicha Gigolashvilla in one round at the Titanic Exhibition Centre on November 5 forced a postponement and Tennyson believes things have worked out perfectly. “I think, in a way, it was probably better because the fight was meant to be in Scotland which made no sense for an Irish title,” said the 23 year-old who is incredibly facing into his 20th professional contest. “The fight is the talk of the place at the minute so I think it was a godsend that it [the cut] happened. Certainly, this showdown is the one that jumps out from Friday’s fight card and represents on paper, a meeting of a puncher in Tennyson and boxer in Geraghty. However, the West Belfast man disputes this and says he is not going out simply thinking of a stoppage win, but will use his skills to bank rounds and whatever happens from there, happens. “I’m going to go out and box a bit. It’s ten rounds, it’s a ten round fight, so I’m not going to go out there and try blast him out,” he insists. “I’m going to go in and box, use my boxing ability, and if it goes to war it goes to war. I think both of us are going to be ready, both men know what’s coming, that it’s going to be a tough night. Despite suffering two defeats so far in his career including that British title defeat to Walsh last April, Tennyson is not thinking this weekend is in any way ‘make or break’, but believes he still has many years to mature and grow into the super-featherweight division, a move he felt was necessary having boiled down to the nine stone limit that was taking away from his stamina and durability. “Coming off that loss it was a bit of a dampener, but if I get a win here it’s going to bring me back up,” he said. “Even going into super featherweight I’m still up there in the top ten of the [British] rankings. “The titles are going to start coming again, and I’m still young. I’ve a lot of time on my hands. “I don’t need to hate someone to want to smash his head in once we step through the ropes,” warned the Dubliner. Certainly, an exciting battle is in prospect, but given the greater pop to his punches, Tennyson can certainly go into this fight full of confidence and knows that a win puts him right back into the frame for greater honours. “I’m still young, I’m 23, and I’ve got time on my hands,” he stressed.